Opus 13 was founded by Joaquín Betancourt in 1980. It had actually been in existence as "Treceto" a group he had at la ENA. Here's a bio page on Betancourt with more info. Joaquín Betancourt - long-time musical director for Issac, and perhaps even more prolific as an arranger than Ceruto. Juan Manuel Ceruto - long-time musical director, saxophonist, and arranger for Paulito FG, producer and arranger of Gracias Formell, A puerto padre, and other important efforts, and now a freelance arranger for everyone from Issac to Adalberto to Boni y Kelly. Paulito FG - singer and leader of one of timba's most important bands. Mariano "Mena" Pérez - later went on to sing with NG La Banda during their second and third important style periods. Tomás "Panga" Ramos - highly respected conguero - played with Paulito, Cubanismo and many others. Miguel "Angá" Díaz - another great conguero who died tragically in 2006. 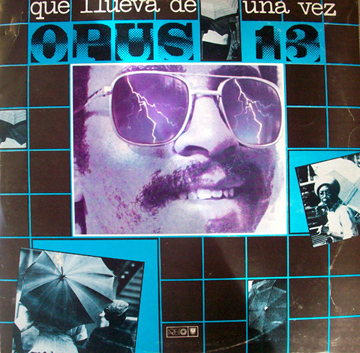 Angá was a founding member of Opus 13 and stayed with the group until 1987 when he went to Irakere to replace El Niño. Please send us a photo, tracklist and EGREM catalog number!!! !